In 1190, Crusading King Richard had been on the throne for two years. His father Henry II had pursued a benign policy toward Jewish residents as they gave him access to capital. 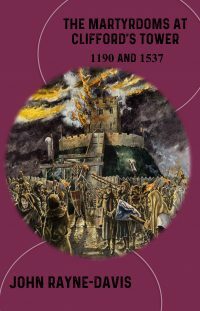 By 1190 anti-Semitic feeling was rife throughout the country with rioting in Norwich, Stamford, and Lincoln. In March, rioting spread to York. Jews were protected by the crown and York’s Jewish residents sought sanctuary in the royal castle. John Rayne-Davies, a York historian describes how this riot led to the eventual deaths on March 16th 1190 of the entire Jewish community in York, approximately 150 souls. In 1537, there was another less well known martyrdom of Robert Aske, a leader of the Pilgrimage of Grace, under the aegis of Henry VIII. He was hanged in chains on 12th of July 1537, one of 216 Catholics executed at this time. This account brings together the martyrdoms of both the Jewish and Catholic minorities.